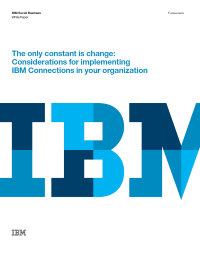 Download this white paper to learn about organizing and executing a successful implementation of the IBM® Connections collaboration platform in your enterprise. Technology, consumer trends and business models are constantly changing and asking businesses to follow suit. Organizations must implement the right social business software that boosts innovation, increases employee and consumer engagement and provides greater efficiency – but can only occur after consistent use.